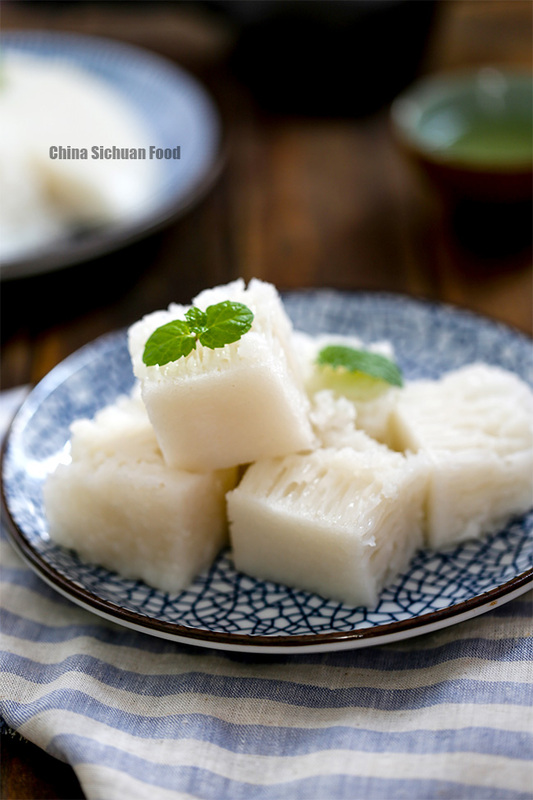 Another yummy Chinese tea treat—Chinese rice cake (Bai Tang Gao in Mandarin and Bak Tong Gao in Cantonese). 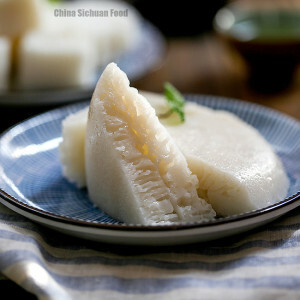 The making process of this steamed rice cake is quite similar with Chinese rice fa gao, but they tastes quite different. 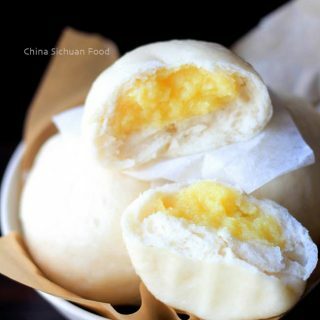 Bai Tang Gao is fluffy and chewy and taste best when cold, while rice fa gao is fluffy but soft. Rice Fa gao should be severed warm. Although the process seems quite simple, there are lots of reasons can lead to failure. 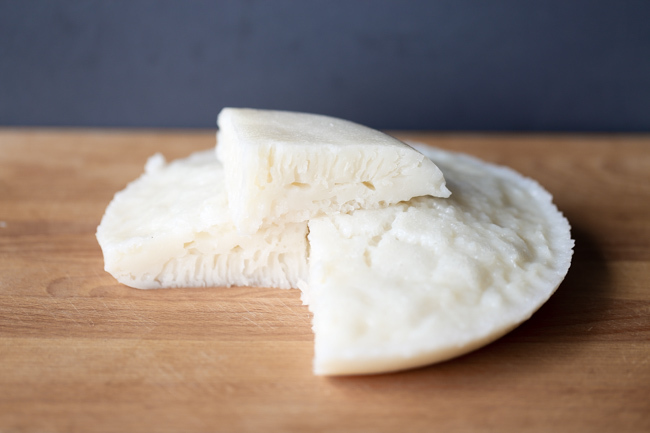 A successful Bai Tang Gao should presents honeycomb texture in center and tastes chewy after cooling down. Following are some of the tips Elaine summarized to help you avoid mistakes. The proofing time actually depends on the room temperature. It may take 2 hours in summer days, but quite longer in winter. A good solution is to place the rice batter into the oven with fermentation function (around 38 degree C). If your oven does not provide this function, place a cup of boiling water within the oven and close it. Bring the water to boil before pouring the rice batter in is extremely important for the honeycomb texture. We need the air steam hot enough to go through the batter and create the bubbles inside. Do not use any oil with strong taste, for example peanut oil. Otherwise, they will spoil the faint rice aroma. Servings: 2 This amount can make 2 cakes (19cm diameter and 4cm high). In a large mixing bowl, mix 150ml to 160ml water with rice flour. Combine well. 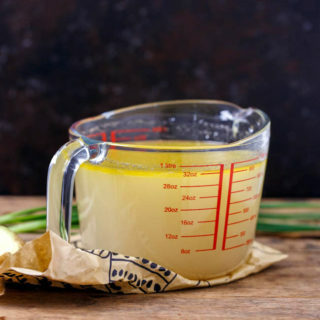 In a small pot, melt sugar with the left water (350ml). Bring to boil over medium fire. Pour the hot sugar liquid directly to the rice mixture. 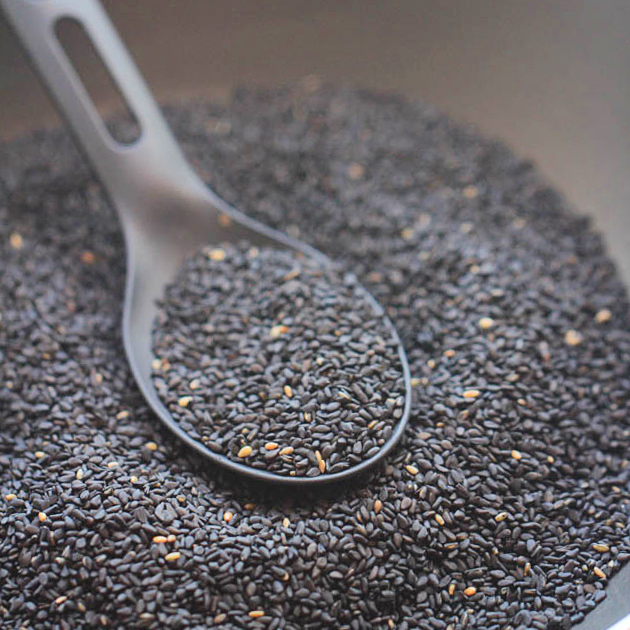 Combine well and set aside to cool down until less than 40 degree C or room temperature. Mix yeast with 20ml and set aside for 5 minutes. Combine yeast water and rice mixture well, cover with plastic wrapper for proofing. Drop several drops of oil in the batter and combine well. Continue proofing until there is a thick layer of small bubbles on the surface. Prepare a plate (steel plate is highly recommended as they are usually quite thin) and brush some oil on surface (this can help the de-molding process). Bring the water to boil firstly and then pour the rice batter to hot steel plate around 80% full. Cover with lid and steam for 15 minutes over high fire. Wait for around 10 minutes after turning off the fire. Transfer the cake out, wait for minutes and move it from the plate. Set aside to cool down completely. Either cut into large wedges or small cubes. Serve cold with tea or as breakfast. The Nutrition Facts is based on each single rice cake. I found your site today filled with wonderful recipes and beautiful photography. Your most recent recipe reminds me so much of my mom who loved this rice dessert so much. I look forward to cooking with you and remembering my mom in the kitchen. Thank you so much for taking the time to blog these recipes for us. Thanks so much for your kind words. Food really is related to our emotion strongly. My grandma loves to cook rice desserts and lots of traditional food for me. But I am living miles away and we can only meet once a year. Each time when I make those childhood yummies, I am missing her too. Happy cooking, love and be loved. I just found your site and am very excited to try your wonderful recipes. I have one question about the yeast used in this one: what kind of yeast is this? Is it the active dry yeast used for baking bread? Thank you. Yes, that’s the one I am using. 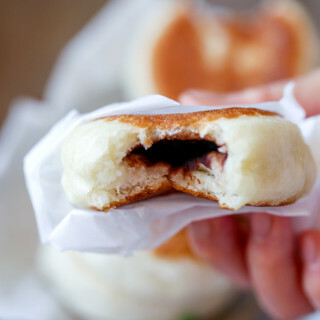 By the way, you can use instant yeast too. Thanks for the recipe, I’m trying it now. Just a note, 250g is really a bit more than 1 cup, not 2. I had to adjust this on the fly to make a double batch. 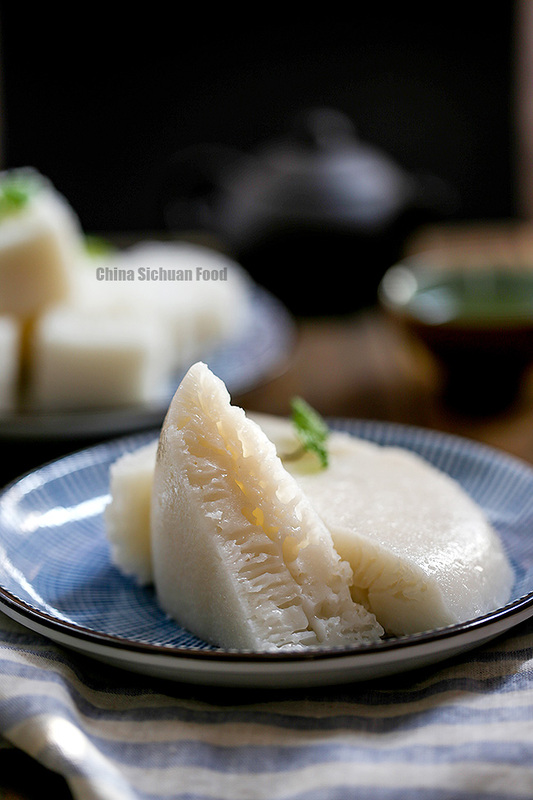 I steamed two cakes with this batch–250g rice flour. Do you need 4? While it is true that 250g of water is a closer equivalent to 1 volumetric cup than 2, because flour is less dense than water, 250g of flour measures out to be slightly more than 2 cups (assuming you’re not packing it too tight). I never truly appreciated the advantage of weight measurements over volume until I started baking. 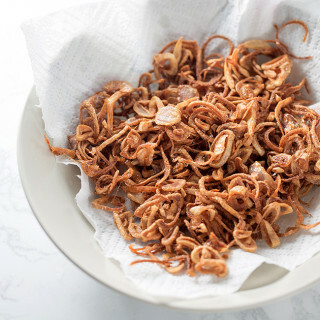 Elaine – thank you for this recipe – it was great for a delicious afternoon snack. I’m going to try your coconut milk pudding next. All your recipes bring back fond memories of childhood…. I agree that weight measurement is much better than volume measurement. For me, volume is never precise especially for baking recipes. Good luck with the milk pudding. It is extremely satisfying too. I bought non-gluten rice flour as I can not take Reg rice flour. Can I use this instead, any variations maybe on the recipe? Pls.advise and thanks. 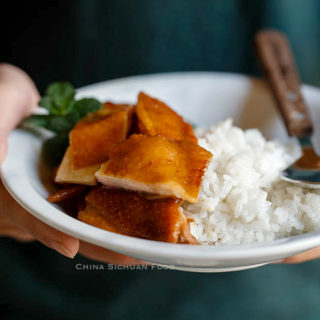 Gluten free rice flour can be used to make this too. Glutenf free rice flour can be used to make this too. Will this recipe still work if I omit out the sugar or reduce the sugar amount to say just 25% of what you used? Wondering if it’s the high level of sugar that helps achieve the honeycomb texture? Thanks for your reply. I have already lowered the amount of sugar. I believe you can start at using half of the sugar listed in the recipe. Theoretically, sugar will not influence the honeycomb texture. Hi Elaine, I love your photos, recipes and tips. I’ve made several of your recipes over the years. I have one small issue. When using the print button at the top of your recipes, my iPad doesn’t show the text of the recipes because the grey background hides the grey letters. So I have to screen shot the recipes and print from photos. Does anyone else have this printing problem? Thanks again for wonderful recipes of foods I love that I can make at home. 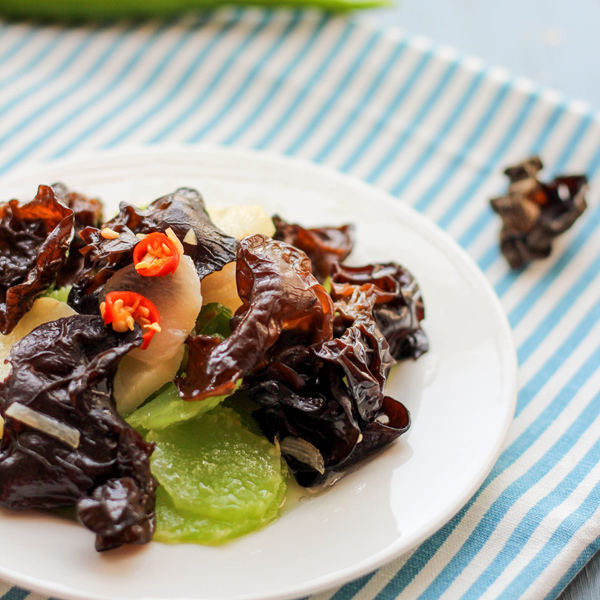 Do you have a recipe for go chong gau? It’s the brown rice cake. It’s usually cut in diamonds and has many white layers topped by a brown layer. Can you describe the cake in more details. For example what are the main ingredients and how it tastes. 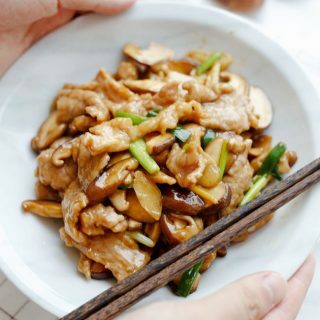 Hi Elaine, I want to try this recipe but I do not have the wok thingy and the steel plate, are they essential for the recipe or can I just use something else to cook the steamed rice cake? Please answer my question, thank you!! It can be cooked in a regular steamer and a round bakeware. Pour the batter in the bakeware and place it in a regular steamer. Can I use Kochi rice instead? Hi there, I tried to make this today and I had to use another 40 mL of water to get the texture and viscosity the same as the video. Has anyone else mentioned this or do you have any thoughts? I was using mL and the 2 cups flour conversion. Another 40ml sound reasonable. The water needed is actually slightly depending on the rice flour. When cook steamed rice, we know water absorption differ from different types. Hi Elaine, thanks for the recipe. 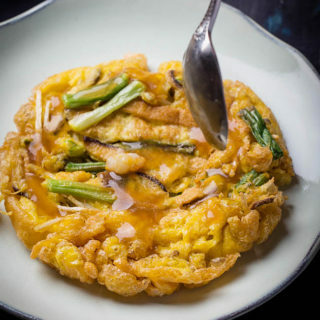 Does it matter what type of rice flour is used? Mochiko or Shiratamako? Rice flour vs Sweet Rice Flour? 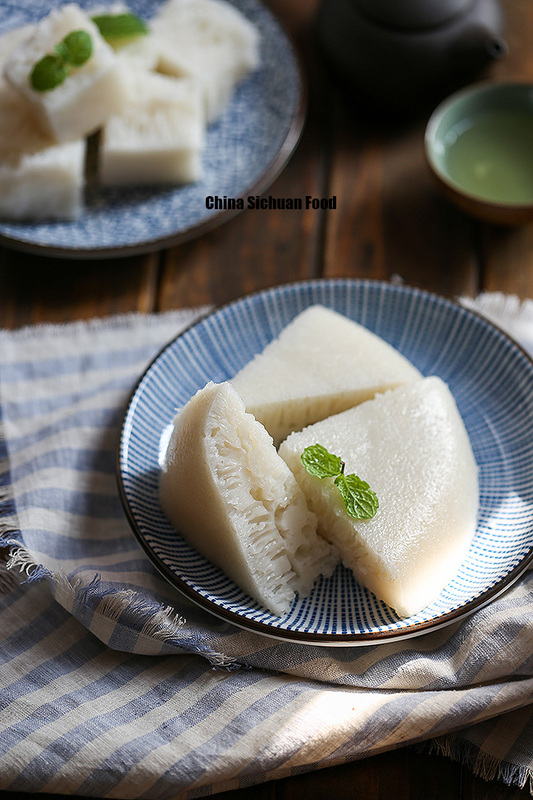 Rice Flour vs Glutinous Rice Flour? Thanks! We use water milled rice flour. Neither Mochiko nor Shiratamako. Just common rice flours.